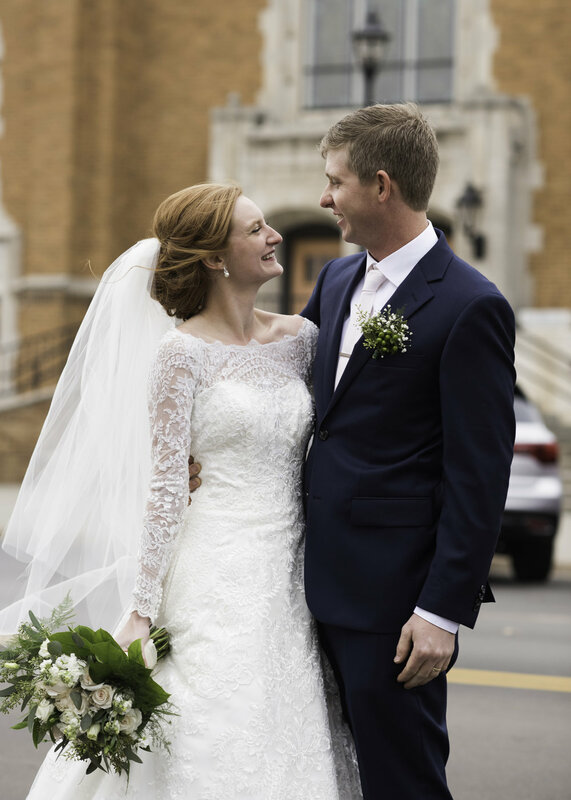 Meet John and Emily… I photographed John’s sister’s wedding last year and I was honored and excited to get to photograph John and Emily’s wedding this year! Isn’t Emily such a beautiful bride?! I just love her hair… and the details on her dress were GORGEOUS! Such delicate lace… and those buttons added just the right amount of interest to the dress. They seem so happy together! You can just feel their love for each other, can’t you? Who knew it would be the coldest days of the season so far?! I am sure there hands were freezing but at least we got some good shots of them outside before they decided to go get warm at their reception! I love that Emily thought of comfort when it comes to her wedding day. She had adorable Converse shoes and her dress had POCKETS!! What?! That is the most amazing invention yet. I love dresses with pockets! The long sleeves were definitely appropriate for the weather that day and the dress looked so elegant on her as well. This image Emily asked me to take to match the one her parents had from their wedding. Such a cute idea! I just love their smiles. They were all smiles that day for sure! What an amazing blessing God has given you to find each other and share your lives together. Thank you so much John and Emily for choosing me to capture your special day!